I can't remember exactly where I heard about A Bride's Story but I recall it sounding really fascinating. In lieu of volume two coming out in a week or two, I thought I'd write up a review of volume one. 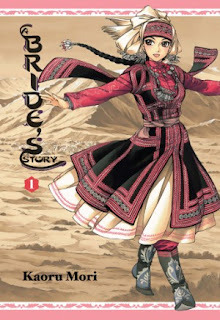 The story is about a girl named Amir, who lives in 19th century Central Asia. At the start of the story, she marries Karluk through their two families' arrangement.Amir is twenty, and knowledgeable about all the things a wife of that period should know. Karluk, by contrast, is twelve and, while mature for his age, has much to learn. Amir goes to live with Karluk and his family, and she eagerly tries to fulfill her role as a good and dutiful wife. Karluk's family is kind, but Amir goes out of her way to prove to everyone that she's a useful and constructive member of the family. Her mother-in-law, for example, presents her with a bolt of cloth as a wedding present, which Amir uses to make some clothing for Karluk. When the mother-in-law is surprised, noting that she assumed Amir would make something for herself, Amir strips her clothes and races to the river to wash them immediately, under the mistaken belief that she was supposed to infer that her clothes were filthy and needed replacing. Karluk's family comes to care for Amir and sees her sincerity clearly. When Amir's brother tries to claim her back (in order to make a "better" offer to another, wealthier family) her honor and dignity are defended to the hilt, and her blood-relatives are sent off. When she diligently attends to Karluk when he falls ill, the rest of the family take care of her, as she neglects her own needs. Despite the story being largely about the day-to-day life of a single family, it does an excellent job of holding the reader's attention. The artwork is intricate and beautiful (particularly Amir's dresses) but the story itself is by no means given the short shrift. And, oddly, it's not like you need to root for someone per se. Because of the setting and the type of marriage, and the type of people Amir and Karluk are quickly shown to be, there's no real concern about their marriage not working. The in-laws, too, seem to be in good relations across the board. The only real family tension of any sort comes from Amir's brother, and grandma put a stop to that in just a few pages. At first, I was going to suggest that the historical setting was what largely held my attention. Central Asia in the 1800s. You don't read about that much over here. What was rural life like for those folks? This book showcases a lot of that. But while you don't need to root for anyone in the book, you do come to find yourself interested and concerned with them. There's not a will they/won't they concern, but just an interest in who these people are. Each character proves him/herself to be interesting, and you find yourself wanting to know more about them all.